1957 "Airbox" Corvette - What is it? I came across this article tonight and have never heard the "airbox" term. Can anyone fill me in on what it is? Three years ago, Bill Connell and Joel Lauman made a remarkable discovery inside a hog farmer's barn in rural Trenton that they likened to "finding a Picasso in your attic." What they found rusting inside that old barn was an extremely rare piece of American automobile history — a 1957 Chevrolet "Airbox" Corvette. Fewer than 50 of these racing-model cars were produced by Chevrolet and fewer than half of them are known to exist today. But even more surprising, the "Airbox" car Connell and Lauman found was the prototype, or "pilot car," used to produce all of the subsequent Corvettes in that 1957 line. That meant the car had unique parts that wouldn't be found on any of the other "Airbox" Corvettes, making it truly one of a kind. "This car is so rare that even the most-dedicated Corvette hobbyists have never seen anything like it," Connell said. "The probability of us finding a car like this is unbelievable," said Lauman, 66, of Colerain Twp. "I wouldn't equate it to finding the Holy Grail, but it is kind of like that in an automobile sense." DZAuto has a super rare (1 of 1) 1956 Airbox! Last edited by 63Corvette; 12-17-2007 at 03:28 AM. Thanks for bringing me up to speed on the "airbox" function and the photos were awesome. Thanks! I dn't think you mentioned the "other" famous name for this wonder car....a 579E.....from the rpo option number, rpo579E. I think someday there will be more than 43 in existance.....thanks to an excellent knowledge base, an existance of brake parts, other necessary parts, and repro air boxes and brake ducts!!! The "forgotten" rare 57 is the rpo684...the heavy duty brake option with the 270 horse 2X4 car...there were ony an estimated 8 of these made. Very cool looking with the 2X4's, brake ducts under hood, wide wheels, etc. Wish I had either one!!! YOU CERTAINLY KNOW YOUR EARLY CORVETTES!! Cool pics, Tom. I thought I saw in Ken Kayser's book that there was an airbox built with the 250 hp engine? I'd look it up, but I loaned out my copy. DZ- Thanks for the information! I for one now know the "airbox" story. Thanks for sharing your knowledge. Keith and Tom, thanks for posting this info. This is a facinating thread, and great to read. It makes you want to go and pick up Ken's book for sure. 3 or 4 years ago at the NCRS Florida Regional someone brought out a real deal, really rough 57 airbox car. 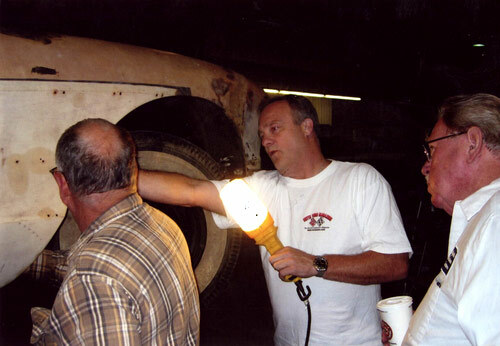 I wonder if that was the "barn find" that is mentioned in the article. I am one of the lucky guys that gets to judge that very car (57 airbox) next month at our indoor mini meet in Dayton Ohio. Well that's just tooooooooooo bad for you now Jerry. Since you opened your mouth, now you're going to be obligated to furnish photos (in detail) of the car, Airbox, connections, ducting, delete plates, brakes, steering, 8000rpm tach, etc, etc, etc. I will get as many as I can and let you know. 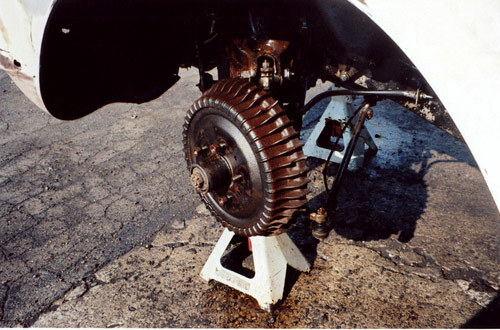 Brakes might be hard to get. Email me a specific list. Not the same car. However your car has been restored and was also in the Bloomington Gold Special this year. The car was raced by Bob Monat and was probably the most raced 57 in the 57-67 time frame. The car was restored by Legendary Motorcar Company and the restoration was a feature the past year on Speedvision Dream Car Garage. It is owned by the Hussey Brothers and may be at the Amelia Island Concour in March. Both cars have had great restorations and the owners are having a great time with the cars. Bill Howe's 1957 Airbox Corvette "4007" was partially disassembled and left in a barn in Butler County until it was purchased in 2005 by car historian Bill Connell and fully restored by restoration expert Joel Lauman. The 1957 Airbox Corvette featured finned brakes that facilitated cooling to prevent overheating during racing. Special duct work on the 1957 Corvette "4007" allowed ambient air from the car's airbox to cool its brakes. 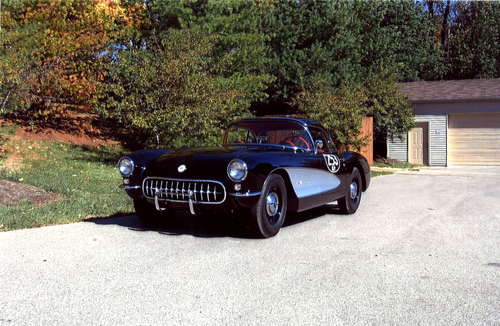 Corvette historian Ken Kayser spent two days in 2005 verifying the car purchased by Bill Connell and Joel Lauman was not only an authentic 1957 Airbox, but was the pilot car of the 43 that were manufactured that year. The airbox on the 43 Airbox Corvettes that Chevorlet made in 1957 is one of the aspects that makes the car unique. 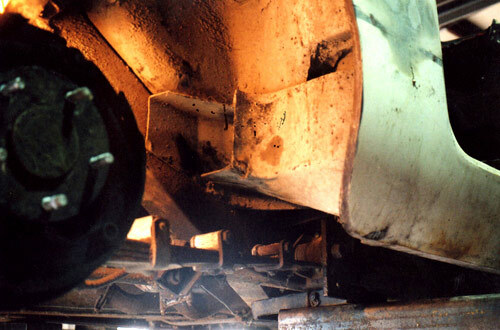 The parts work together to help keep the engine and brakes from overheating. 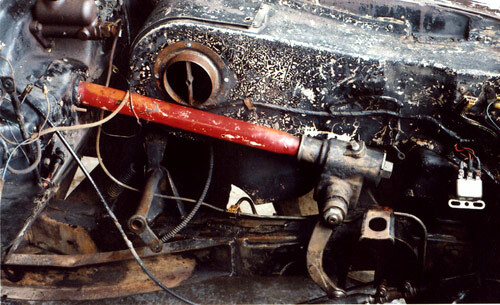 This picture shows the airbox before restoration. Additionally, I used the information gleaned from this thread on a post about the 1957 airbox Corvette on my Corvette Blog. I'd especially like to thank DZAUTO again for his background information on the airbox option. Being on a dialup it takes me awhile to post. These were taken at Bloomington this year. Car was not completey done but they were gracious enough to bring it. I think they had painted the day before it got there. It looks like it also has a soft top (deck lid latches). I'm surprised a racer would have the soft top. What better way to loose extra pounds. On a C2 you can remove about 40# by removing the soft top. Just four bolts. Mmmmmmmmmmmmmmm, Tyler, am I seeing red DUCT TAPE holding the tach on the steering column????????? Tom this car had a metal tach fairing installed at the factory. Chevrolet droped this and several other items on later airbox cars. You don't need a list, when you look at it and judge it, take a picture and move on to the next item to be judged! That's not the way it works. I may doing interior which means I will not be judging the rest of the car. I can take any pics I want though. 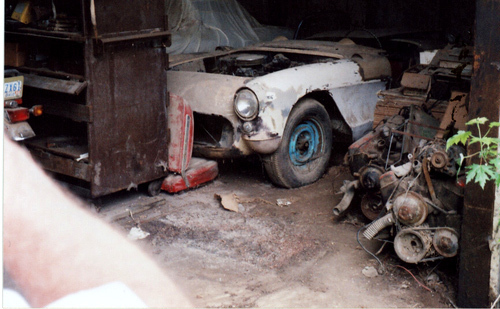 Quick Reply: 1957 "Airbox" Corvette - What is it?